After going more than seven weeks without a leader, the nation's first dedicated commercial spaceport, Spaceport America, now has a new executive director. Former civilian Air Force official Christine Anderson was announced as the new choice today (Feb. 28) by New Mexico's recently elected Gov. Susana Martinez. 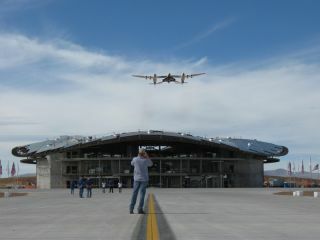 Anderson was voted in as executive director of the New Mexico Spaceport Authority by the Spaceport Authority Board of Directors, which oversees Spaceport America. The previous spaceport director, Rick Homans, resigned Jan. 5, citing pressure from Martinez after she took office this year. Homans had worked closely with former New Mexico Gov. Bill Richardson, a champion of the spaceport project, and accused Martinez of holding back her full support. Martinez has suggested recruiting more private investment to save the state from having to contribute such a large share of funding for the project. She pledged support for the new spaceport director. "I am pleased that the Spaceport Authority Board of Directors has chosen an exceptionally qualified individual to oversee operations at the spaceport," Martinez said in a statement. "With proper management and the right approach, the spaceport project has the potential to create jobs, spur economic development, and make New Mexico a leader in space travel. My administration is committed to working closely with Ms. Anderson and the Board of Directors to attract private investment and see the project through to its full potential." Anderson is a retired civilian member of the U.S. Air Force who served as a member of the Senior Executive Service, earning the rank of the civilian equivalent of a general officer. While serving for several years at New Mexico's Kirtland Air Force Base, Anderson directed the Space Vehicles Directorate and the Space Technology Directorate. She also worked as director of the Military Satellite Communications Joint Program Office at the Air Force Space and Missile Systems Center in Los Angeles. "I am excited for the opportunity to lead a project that has such a high potential for success," Anderson said in a statement. "I look forward to working with Governor Martinez and the Board of Directors to ensure that the spaceport is developed into an economic engine that can drive development and job creation in New Mexico."